This pretty apartment (150m2) is situated in a Tuscan stone farmhouse which nestles peacefully in the foothills of Cortona. 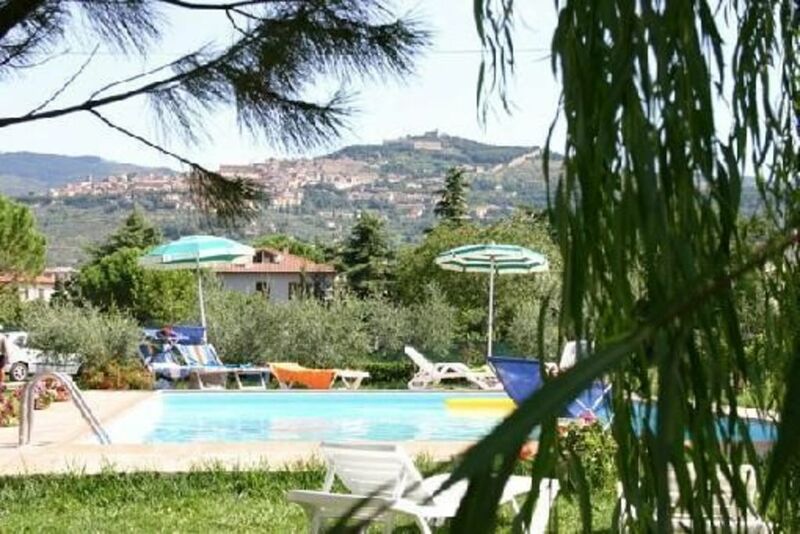 Immersed in the beautiful landscape of the Valdichiana valley, it enjoys lovely views over hilltop villages, sunflowers, olive groves and cypresses. It is conveniently located for those who wishing to visit Tuscany and Umbria. The farmhouse which dates from the 19th century has been recently restored and care has been taken to preserve its original features such as terracotta floors, beams and fireplaces. The pool (12 x 6m) is spacious and the well-kept gardens with tables and barbecue offer pleasant areas for alfresco dining and relaxing. The apartment is located in a 19th century stone farmhouse. It is elegantly furnished in a traditional Tuscan style with chestnutwood furniture and has terracotta floors and exposed beams. There are 4 double bedrooms and 2 bathrooms. The living room has an open-plan kitchen and dining area and double sofa bed and television (foreign channels). There is a large private verandah with table and chairs, where you can eat outside. There is a fully-equipped laundry room on the ground floor of the main farmhouse for guests to use. The area offers numerous country walks and riding, tennis and golf are nearby. Bikes and mountain bikes are available for the guests' use. The railway station at Camucia and the shops and restaurants are a 5-minute walk away (1 km). It is 3 kms from Cortona, 30 km from Arezzo and 40 kms from Siena.